Publisher's TypeFoundry is a vector and bitmaped font editor, and can convert between LaserJet, GEM, Windows, and PostScript fonts. It was intended for use along side desktop publishing software like Ventura Publisher and PageMaker. TypeFoundry was produced by Z-Soft, the same company that sold the famous PC Paintbrush. Interestingly, this software runs under Windows 2.x. The box advertises itself as an "Infinite font cartridge". 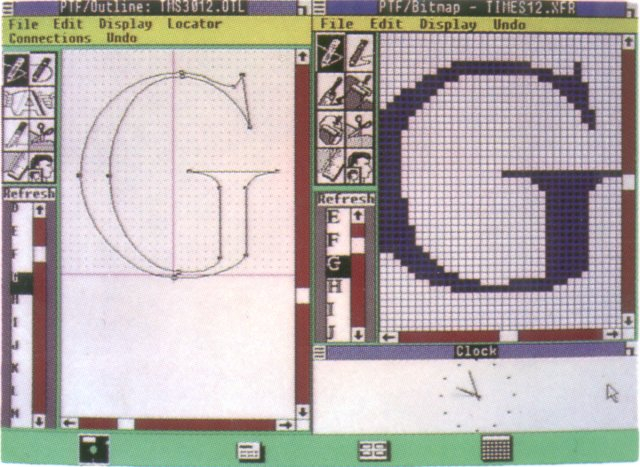 When this software was produced, fonts and font management were not simple things. 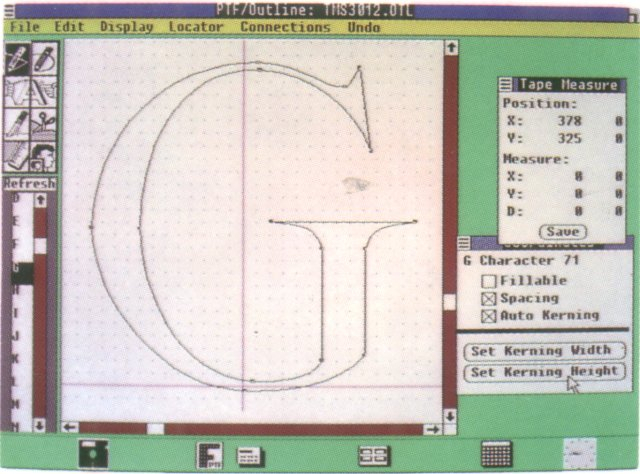 Printers often had fonts in ROM or ROM cartridges. DOS programs usually did not have the ability to mange or render fonts themselves. Instead programs would tell the printer which font to use, and the printer would do the heavy lifting. Windows 1, 2, and 3.0 only supported bit-mapped fonts with limited size selection and jagged smaller fonts scaled up. The ability to convert a vector font in to a high resolution bit-mapped font, could vastly improve the appearance of a document. The ability to convert enables the re-use of commercial fonts between applications, and improves the ability for GUI based applications to provide What-You-See-Is-What-You-Get documents. To aid importing and manipulating font images, this software also includes ZSoft PC Paintbrush 1.09 for Windows. 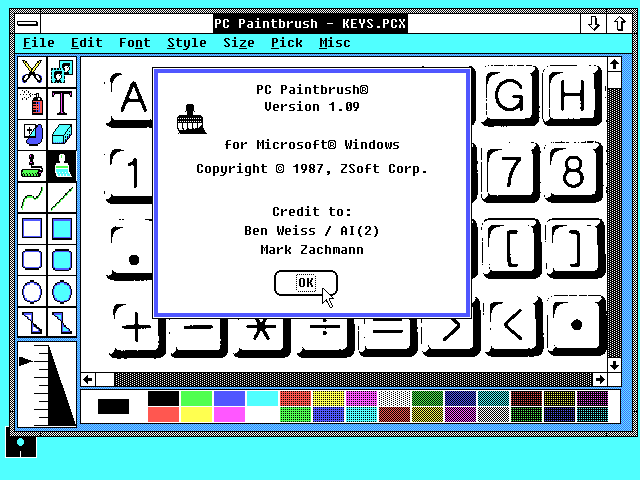 The applications on this disk, including PC Paintbrush, only run under Windows 2.x, but the box itself suggest that TypeFoundry 1.0 may have run under Windows 1. Also notice, it looks like these screen shots are running in a resolution higher than EGA. 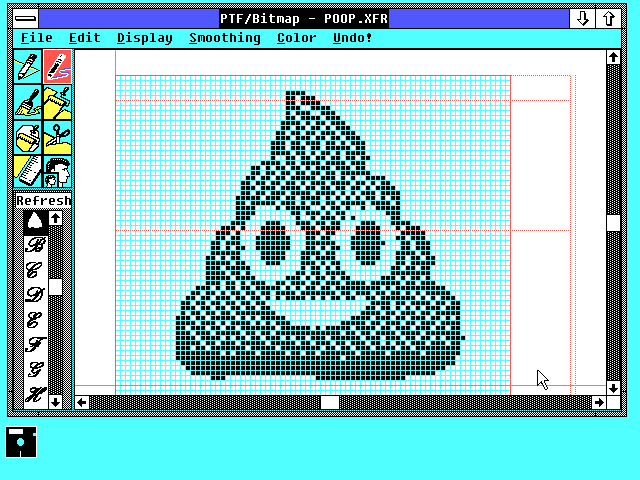 In addition to text characters, you may design foreign characters, mathematical symbols, or smiling pieces of poo. Because apparently that is what fonts are for these days. 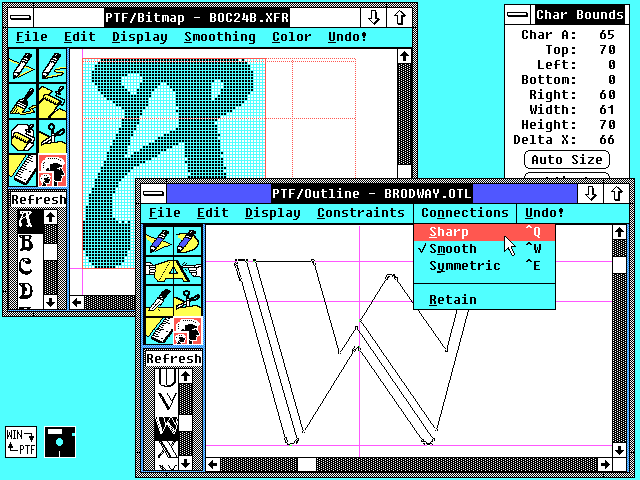 So if you needed a fancy new typeface or symbols under Windows 2, this was the tool for you.